Only a small percentage of people make a decision right away. And, most take days to make them. Remarketing keeps your business top of mind while they think about it. Have you ever searched for a business online, decided to wait to contact them until later, and then forgotten about them? Or maybe you wanted to contact them but got distracted before you did. Whatever the reason, you put your decision on hold. And the business has to depend on you to remember to come back to contact them later. Compare that with the times you’ve been disctracted and then keep seeing that business follow you around the Internet. You go to a news site, and there’s an ad for the Law Firm you’ve been looking at online. Then you flip over to Facebook and see the Law Firm tempting you from the sidebar. The ad is everywhere, and it keeps reminding you how much you need to contact them. Remarketing is a strategy that makes your business look like it has a huge advertising budget, that your company the most popular one out there, and gives a not-so-subtle reminder to the consumer to follow through on their initial impulse to contact you. And in a busy world like ours where attention is hard to find (and keep), these reminders make a significant increase in business. Want to learn more about sending these friendly nudges to people who are this close to contacting you but get distracted before they click that button? Then download our free Digital Marketing Strategy Guide right now. 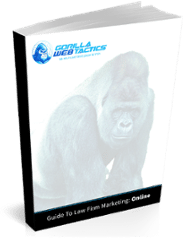 Inside, you’ll discover how remarketing works (it’s simpler than you think)—plus seven more hyper-specific secrets to online marketing in the simple, no-nonsense language you’ve come to expect from Gorilla Webtactics.